I was first introduced to the Randall’s Island rice paddies in miso form, as part of former Momofuku R&D chef Dan Felder’s experiments to develop a truly local terroir for the restaurant’s New York City iteration of Asian cuisine. 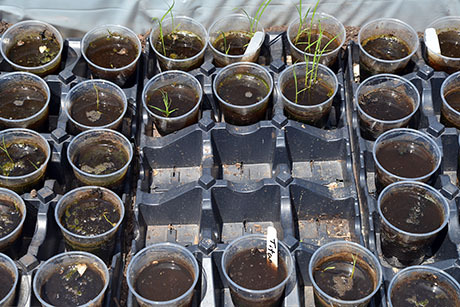 IMAGE: 2014’s rice seedlings germinating inside the greenhouse at Randall’s Island Urban Farm. All photographs by Nicola Twilley. But, although the rice’s microbes were proving somewhat recalcitrant, I was delighted to learn earlier this year that the rice itself was thriving. 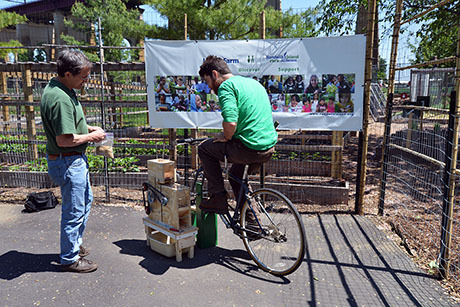 In a presentation at this year’s Roger Smith Food Tech Conference, Nick Storrs, the manager of Randall’s Island Urban Farm, proudly described the exponential growth of the city’s only rice paddy fields, from the first experimental one in 2011, to five this season. Growing rice in New York City, thousands of miles north of its traditional home in Arkansas and California, turned out to be surprisingly easy, Storrs explained. Hulling it — removing hard husk that protects each individual grain of rice — was the real challenge. That is, until a microscopist for DuPont spent two winters tinkering in his basement, bolting together bike chains, chopping boards, and boat launch bumpers to design and build the missing machine that could crack open micro-scale rice markets across America. 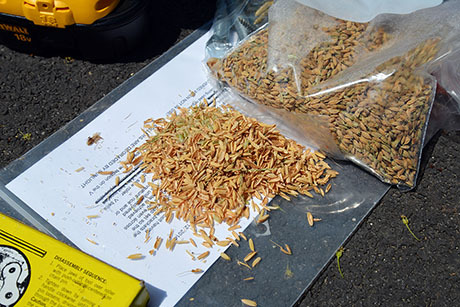 IMAGE: Randall’s Island paddy rice (right) and hulled rice with chaff (left). 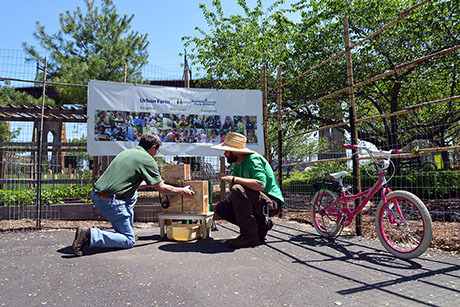 A few weeks ago, I went out to Randall’s Island to witness the delivery of their very own bike-powered rice-huller and to talk with Don Brill, its unlikely inventor. You’ll have to head over to the New Yorker to read the rest of the story (well worth it, in my unbiased opinion), but here are some additional photos for when you come back. IMAGE: Don Brill and Nick Storr kneel to set up the rice huller. IMAGE: Nick Storrs on the bike, hulling rice. IMAGE: The rice huller from the side. 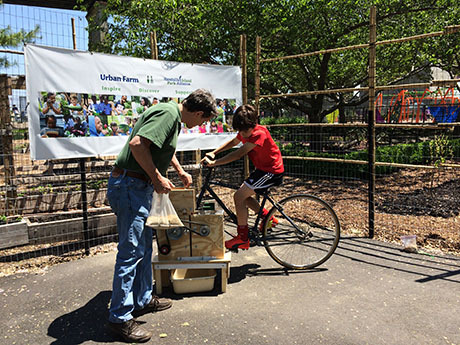 IMAGE: Don Brill adds paddy rice to the huller while a random child tries out the bike. 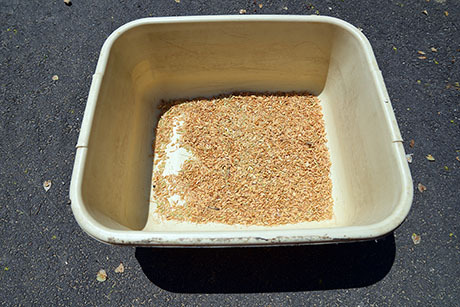 IMAGE: Hulled rice and chaff in the beige bus tray. This still needs to be winnowed before consumption. 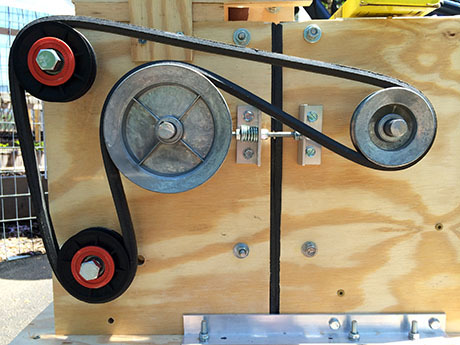 For the full story, check out “The Rube Goldberg of Rice” at the New Yorker online.